Classic Amazon River vessel offering modern comfort. 15 cabins. 1st-class cruises to Pacaya Samiria from Iquitos. Multiple excursions to rainforest. Classic, wooden Amazon River vessel refurbished to offer modern comfort. 15 air-conditioned cabins with space for 31 passengers. Great value prices for these cruise packages with 2 nights in Lima AND domestic flights to the Amazon included. Last-minute offers saving up to 20% often available. Ask us for more information. 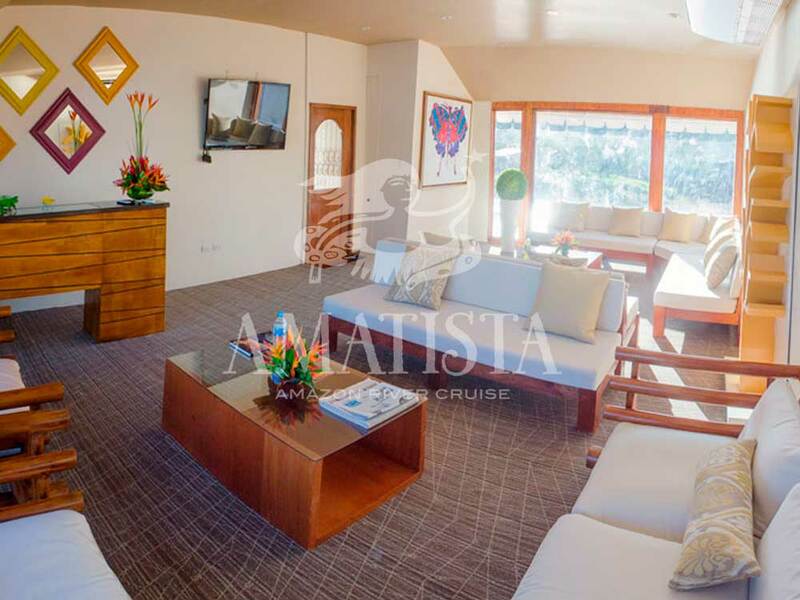 M/V Amatista - meaning amethyst in English - was built and fitted out by Amazon carpenters and shipwrights, using traditional methods and designs, so as to create an authentic atmosphere while providing all the facilities for a relaxing and comfortable stay. There are 15 air-conditioned cabins on board and the amenities include delicious international and local cuisine, an observation deck equipped with a full-service bar and both an indoor and outdoor lounge. Highly trained naturalist guides - and the entire crew, numbering 15 - provide a first class-service, with personal touches, that completes the experience. The M/V Amatista operates fixed four and six-day cruises in and around the Pacaya-Samiria National Reserve - the largest national park in Peru and an area unrivaled for wildlife. Included in the price of these are two nights in Lima and the flights from here to Iquitos and back. This five-night riverboat cruise gives us a chance to get a real feeling for life in Amazonia, which is in fascinating contrast to our daily lives. The itinerary is designed to be flexible, to accommodate the sharp variations in water levels over the course of the year, but takes in the Yanayacu Communal and Pacaya-Samiria Reserves, a shaman ceremony, along with multiple guided excursions by skiff and on foot to explore the rich flora and fauna. Meanwhile, the three-night cruise embarks in Nauta, and is ideal for those on a tight timeframe who want to enjoy an authentic and intense snapshot of natural and human life in and around Pacaya Samiria. If the above dates don't work, for a similar standard of facilities and service, have a look at La Perla or the Amazon Star.